Samsung launched one of its most innovative smartphones in recent years, the Galaxy A80, at an event in Thailand today. While the sliding smartphone with a swivelling camera module stole the limelight at the event, innovation doesn’t come cheap. Therefore, if you want bleeding-edge tech, be prepare yourself to shell some serious bucks. However, if you don’t care for theatrics, Samsung also showcased the Galaxy A70 as well in Thailand today. The smartphone has already been launched last month, but is yet to arrive in India. 91mobiles was at the launch event in Thailand and here’s our hands-on experience with the Galaxy A70. First things first, the Galaxy A70 flaunts a ‘Glastic’ make, which is a fancy term Samsung has invented for the glossy plastic body. There are no dramatic design elements here like the Galaxy A80, and the smartphone comes across as any other mid-ranger. The smartphone features physical buttons for volume and power on the right spine, while the left edge is home to the SIM tray. At the bottom, you will find the USB Type-C port, 3.5mm audio jack and loudspeaker grille. Samsung has kept the back panel of the smartphone pretty minimal with a triple camera module in the top-left corner and logo in the centre. The fingerprint scanner is missing since the Galaxy A70 features an in-display optical biometrics module. Speaking of which, the Galaxy A70 comes with a 6.7-inch Super AMOLED display with 2,400 x 1,080 pixels screen resolution. 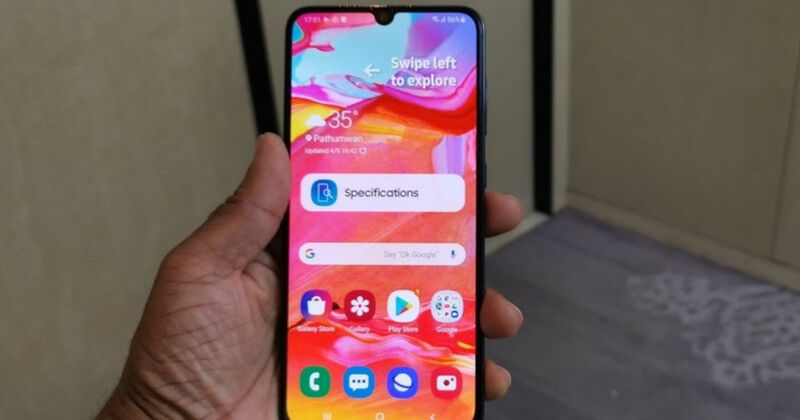 The Galaxy A70 screen flaunts an aspect ratio of 20:9 and features the Infinity-U display that has waterdrop notch on the top. The unique aspect ratio makes the smartphone more suitable for streaming video content as most video services support 21:9 ratio. Coming to the performance of the handset, the Galaxy A70 is powered by Qualcomm’s Snapdragon 670 SoC, which is an octa-core unit clocked at 2.0GHz. The processor is backed by 6GB RAM and 128GB storage, which can be expanded using a microSD card. On the software front, the handset boots the latest One UI interface based on Android 9 Pie. This is the same software that runs on the flagship Galaxy S10 series and has managed to impress us with its clutter-free experience. Powering the smartphone is a beefy 4,500mAh battery. Let’s talk about the triple camera module on the rear panel of the Galaxy A70. The setup comprises a 32-megapixel primary camera with f/1.7 aperture, which is accompanied by an 8-megapixel ultra-wide angle and a 5-megapixel depth sensor. For selfies and video calling, a 32-megapixel shooter with f/2.0 aperture is nestled in the notch. The camera app is loaded with the usual features like AR Emoji, Live Focus, Scene optimiser and more. Our initial shots with the smartphone from both rear and front cameras were pretty impressive. Needless to say, Samsung has managed to perfectly balance its A-series line-up with smartphones that can cater to all niches. There is the top-end Galaxy A80 that will appeal to people who prefer cutting-edge technology and then there is the Galaxy A70, which is more straightforward in its approach. The Samsung Galaxy A70 is yet to arrive in India and it will be interesting to see where the Chaebol positions it price-wise.